Pokemon Go Review | GameXcess.net - Gaming News, Videos and Editorials! Earlier this week Niantic and The Pokémon Company released this year’s most anticipated SmartPhone app, Pokémon Go, on Android and iOS phones. Pokémon Go is a free to play SmartPhone game heavily inspired by the Google Maps April Fool’s day prank from two years ago. In it, you take on the role of a Pokémon Trainer trying to capture Pokémon in the real world. To succeed, you must trek around your physical surroundings in a search for hidden Pokémon to capture using your SmartPhone’s camera. This is the kind of game that Pokémon Trainers like myself have been hoping to see since the iPhone was first announced back in 2007. Now that it’s out, I’m sure you’re wondering how well it works. You’ve come to the right place. I must stress that this review of the app is based on its launch software played without the aid of a Pokémon Go Plus accessory. Those devices are not expected to release until the end of the month, and we will do an alternate review for them when they become available. With that out of the way, let’s start at the beginning. To play the game you must download the application to your device and create a Pokémon Trainer. You can log into the app by either creating a unique Pokémon Trainer account or, if you already have a Google account, you can log into the game using that. 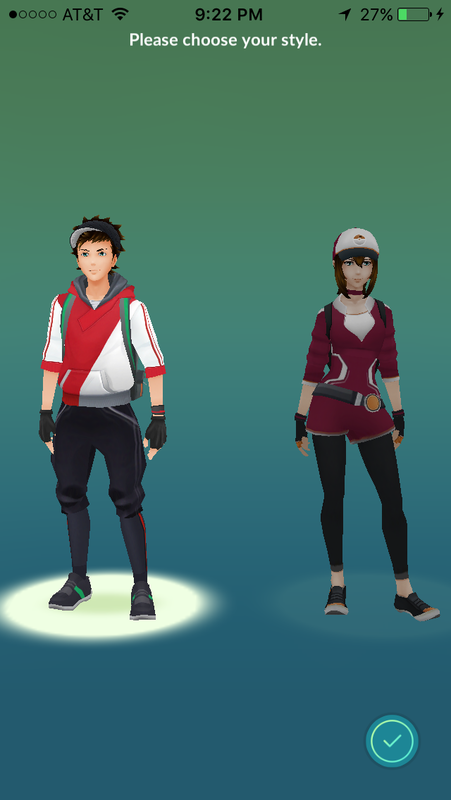 Once you logged in, you can customize your own Pokémon Trainer avatar. Options for your initial Trainer customization is limited but still diverse enough for you to create a unique likeness. When the game starts, the Pokémon Professor asks you to pick your starter. Your choice is among the three GEN1 starters, Charmander, Squirtle and Bulbsasaur. After selecting which starter you like, the game immediately fires up and gives you an opportunity to capture it. This is your first experience with the game’s unique capture system. In it, you use the touch screen to “throw” Pokéballs at the Pokémon you encounter in the real world. Thankfully, unlike the main Pokémon games, there is no need to weaken Pokémon found in Pokémon Go in advance before capturing them. If you are able to throw the ball well enough, you may succeed in capturing it. Once I had my starter captured, I received no further tutorial on how to play the game, other than the vague request to visit a local Poké Stop, which in my case was a church down the street from my house. When I got close enough to the church, I was able to access the stop in the app and I earned myself some free Pokéballs. When you bring up the app, it is implied that you will use it while physically walking around your real world environment. A radar in the lower right gives you a general idea about what kind of Pokémon might be in your area, but it’s no guarantee of what you will find during your trek. Turn on your speaker because the game’s phenomenal soundtrack is a great companion. While you’re walking around your environment, you may randomly come across various wild Pokémon. Their appearance is denoted by a buzz and loud music queue. By tapping on them once they appear, you will bring up a capture screen, where you will be able to see the Pokémon you selected in your device’s camera. From there you can attempt to capture it and if you’re successful, you’ll gain the Pokémon and some experience. When it works, it is so much freaking fun and adds an all new layer to physical activity. If you wish to evolve or level up your Pokémon you can do so with the help of stardust and candies. You earn stardust and candies automatically with every capture but while stardust can be applied to level up any Pokémon, candies are specific to only the Pokémon of the species you captured. If you want to level up the stats of a specific Pokémon, you can use Stardust and only a few candies to increase their stats. If you want to evolve it, it takes a lot of candies. That means you might want to capture a lot of Pidgeys to eventually evolve one of your Pidgeys into a Pidgeotto. If you don’t feel like going anywhere you can drop an incense and the Pokémon will come to you. The item will continue to work for thirty real-time minutes. This is a great item for people unable to go outside at a time they want to play the game. Currently, you must keep the application running at all times to make use of it. Your smartphone will not notify you of any Pokémon you encounter while the app is closed. This will probably change once the Pokémon Go Plus accessory is released. As you capture more Pokémon your Trainer rank will increase, and with every rank you automatically earn some free items like Pokéballs, Potions, Incense and Revives. There are currently no Great Balls, Ultra Balls or Master Balls in the game, all captures are made with regular Poké Balls so you’re going to need a lot of them. If your supplies run low, you will need to visit a Poké Stop location, or you can buy your supplies with real money. If you find a Pokémon Egg, you can hatch it by setting it to incubate. Depending on which incubator you use, the egg will hatch once you’ve walked the expected distance the incubator requires. The incubator I’m using requires me to walk two kilometers to hatch an egg. The game is currently programmed with the initial Generation I (GEN1) Pokémon, but more will be added. Currently there is no way to trade Pokémon with other players but the developers have stated this is intentional. They want us to start accumulating Pokémon on our own before we start trading them. If we could talk about one major negative I have with this game I must make a reference to the fact that while the game’s 3D Pokemon models are extremely detailed and true to their original designs and sound effects, the game’s map environment (which is what you’ll be looking at most of the time) is pretty uninspired and does not share any relation to Pokémon’s style. Take a look for yourselves. Not even the game’s Pokémon Gyms or Poké Stops look all that visually interesting or even remotely close to their in-game counterparts. 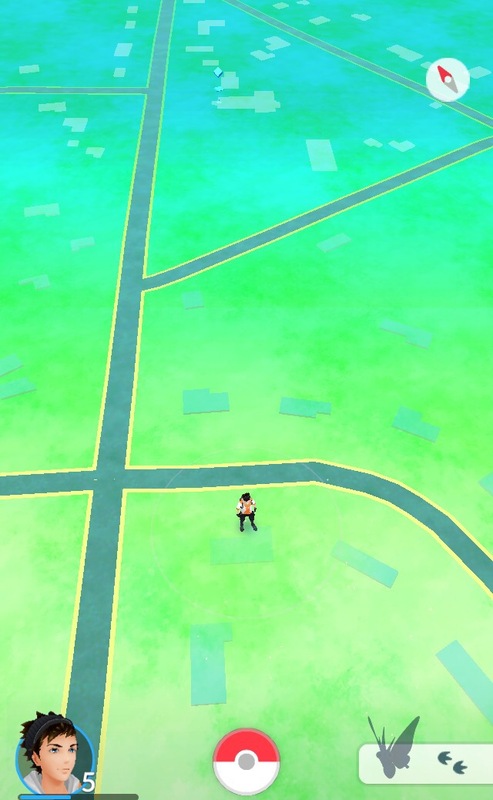 Poké Stops look like a small blue mark on your map, nothing like the Pokémon Centers you would traditionally see in a Pokémon game. Gyms looked like nothing more than generic towers. Easy to see on a map but with none of Pokemon‘s unique charm. This is depressing because you can easily see how much care was put into replicating the Pokémon 3D models, the game deserves a more inspired world map. Hopefully this interface will be improved in a new version. In the time since I’ve had this game I’ve had to deal with constant random crashes, connection denials and yesterday I was regularly forced to log in more times than I could count. I would normally say that this game wasn’t beta tested, but I know for a fact that it was tested by Pokémon fans all over the world! What happened? I know for a fact I offered to Beta Test this game, but Niantic decided not to accept my help. Most of these technical issues seemed to be caused by the sheer amount of simutanous users playing the game in real-world conditions. During development, Niantic decided to limit worldwide Beta Testing to a select lucky few. Perhaps if they had accepted more testers to stress the game, their service might have been better prepared for what was in store for them when the game officially launched. In short my advice about this game right now is to download the game but don’t spend any money on it until the network stabilizes. There is a fun game here under an uninspired interface and constant technical issues. In time I’m sure it will come out.